Low back pain is one of the most prevalent musculoskeletal conditions and the highest contributor to disability in the world. It is characterized by frequent relapses leading to additional care-seeking. Engagement in leisure physical activity is associated with lower recurrences and better prognosis and potentially reduced care-seeking. Our aim was to investigate the feasibility and preliminary efficacy of a patient-centred physical activity intervention, supported by health coaching and mobile health, to reduce care-seeking, pain and disability in patients with chronic low back pain after treatment discharge. We conducted a pilot randomised controlled trial with blinded outcome assessment. Sixty-eight participants were recruited from four public outpatient physiotherapy departments and the general community in Sydney. The intervention group received a physical activity information booklet, plus one face-to-face and 12 telephone-based health coaching sessions. The intervention was supported by an internet-based application and an activity tracker (Fitbit). Control group (standard care) received the physical activity information booklet and advice to stay active. Feasibility measures included recruitment rate, intervention compliance, data completeness, and participant satisfaction. Primary outcomes were care-seeking, pain levels and activity limitation. Outcomes were assessed at baseline, 6-month follow-up and weekly for 6 months. Ninety potential participants were invited over 15 months, with 68 agreeing to take part (75%). Overall, 903 weekly questionnaires were answered by participants from a total of 1107 sent (89%). Participants were largely satisfied with the intervention (mean = 8.7 out of 10 on satisfaction scale). Intervention group participants had a 38% reduced rate of care-seeking (Incidence Rate Ratio (IRR): 0.62, 95% CI: 0.32 to 1.18, p = 0.14, using multilevel mixed-effects Poisson regression analysis) compared to standard care, although none of the estimates was statistically significant. 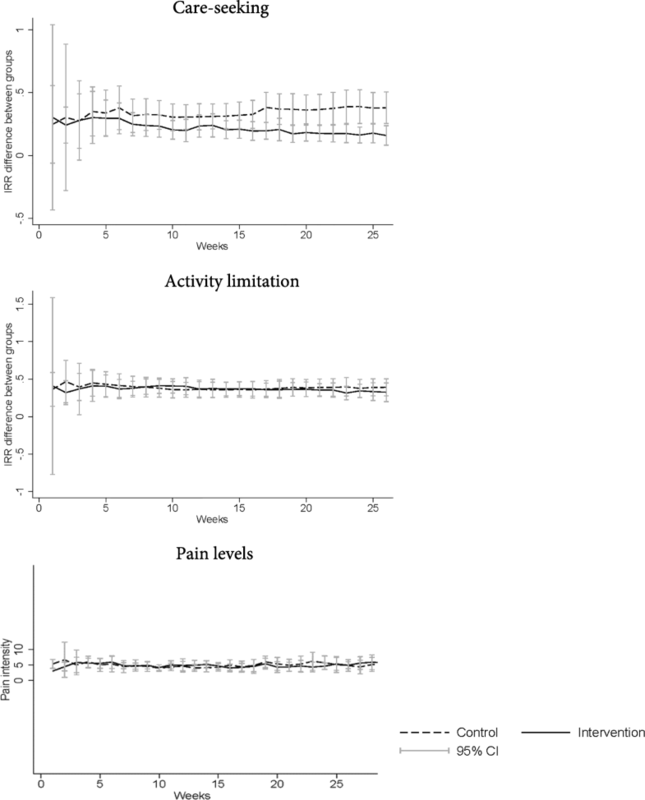 No between groups differences were found for pain levels or activity limitation. The health coaching physical activity approach trialed here is feasible and well accepted by participants and may reduce care-seeking in patients with low back pain after treatment discharge, although further evaluation with an adequately powered trial is needed. Australian and New Zealand Trial Registry ACTRN12615000189527. Registered prospectively on 26–02–2015. While there is evidence that conservative interventions, such as exercise and spinal manipulative therapy, improve short-term pain and disability in people with chronic LBP, [9, 10] patients typically exhibit a rapid decline in clinical outcomes after treatment discharge, [9, 11] and further care-seeking for LBP is common. For instance, a recent longitudinal study conducted in Denmark involving 1082 participants presenting with non-specific LBP to general practitioners (GP) and chiropractors showed that over a 1-year follow-up period people still report having mild to moderate LBP (mean intensity of 3 on a 0–10 pain scale), on an average of 3 days per week. Likewise, 32% will seek additional care (e.g. GP visit) over the course of 5 years after primary care treatment . A potential contributor to clinical decline is lack of adherence and motivation to maintain physical activity levels as recommended by LBP self-management guidelines. It has been suggested that leisure-time physical activity has a positive impact on the course of LBP. For instance, people with chronic LBP who are physically active experience less pain (− 0.6, 95% CI: − 1.0 to − 0.1; 0–10 numerical pain scale) and disability (− 8.7, 95% CI: − 14.2 to − 3.1; 0–100 disability scale) than those not maintaining adequate levels of physical activity. However, most people with chronic LBP tend to become more sedentary during their leisure time than those without chronic LBP. [17, 18] According to qualitative studies exploring the experiences, opinions, and treatment expectations of chronic LBP patients, [19, 20] although patients recognise the value of advice and exercise, they usually mistrust the appropriateness of this approach given the fact that a precise diagnosis of their condition is rarely given, and symptoms often recur. Consequently, poor adherence to advice and physical activity seems to be the primary factor limiting the potential effectiveness of long-term active self-management strategies for chronic LBP. A systematic review of 20 high-quality cohort studies found substantial evidence suggesting that poor treatment adherence was correlated to low levels of physical activity at baseline, low self-efficacy, depression, anxiety, insufficient social support/activity, more perceived barriers to exercise and increased pain levels during exercise. Therefore, interventions aimed at supporting people with LBP to engage in active lifestyles after treatment discharge should be encouraged. Patient-centred approaches, supported by shared decision making, are usually more effective than general, non-specific approaches for promoting behaviour change, such as engagement in physical activity for people with non-specific chronic LBP. [21–24] A recent systematic review demonstrated that patient-centred approaches, such as motivational interventions, are effective at increasing physical activity behaviour for different clinical populations, including people with LBP. Health coaching is based on behaviour change theory and aims to encourage and support healthier lifestyle choices. [26–28] There is strong evidence that health coaching can positively impact on health behaviours, including physical activity,  nutrition,  smoking cessation,  and self-management of chronic conditions. Additionally, Mobile health (m-Health) technologies, such as internet-based platforms (e.g. web applications, websites) are increasingly used to support behaviour change. M-Health has the potential to increase accessibility of treatment through the delivery of convenient, individually tailored, and contextually meaningful behavioural interventions. [33–35] Likewise, physical activity trackers (e.g. Fitbits) are effective in promoting physical activity uptake in people with musculoskeletal conditions, including LBP. [36, 37] However, the effectiveness of health coaching in addition to m-Health technologies to increase physical activity levels and improve health outcomes in a population with chronic LBP after treatment discharge is unknown. Therefore, we designed a pilot trial to test the feasibility and preliminary efficacy of a patient-centred physical activity intervention, supported by health coaching and m-Health technology to reduce care-seeking, pain and activity limitation in patients with chronic LBP after discharge from conservative treatment, compared to standard care. The secondary aim was to examine the effect of this intervention on physical activity adherence and goal attainment. The trial protocol has been published in detail elsewhere  and is summarised briefly here. We conducted a pilot randomised controlled trial with blinded outcome assessment. The trial is reported in accordance with the CONSORT guidelines for clinical trials  and the intervention is reported in accordance with the TIDieR checklist for reporting of interventions. The Human Research Ethics Committee from the South Western Sydney Local Health District approved this study (project number: 15/015). Participants gave written informed consent before data collection began. Participant recruitment was conducted between March 2016 and July 2017. Participants were recruited from outpatient physiotherapy departments of four public hospitals and from the general community in Sydney metropolitan area. This was a deviation from the protocol where we proposed recruitment from a single hospital. Due to low recruitment rate we expanded our recruitment to patients who met the inclusion criteria in three additional hospitals as well as the general community. To expand the recruitment to the general community we amended the inclusion criteria to include people that were discharged not only from a hospital-based physiotherapy treatment but also from private practices (e.g. physiotherapy, chiropractic or GP). At the hospitals, individuals were invited to participate in the trial by their treating physiotherapists. Participants from the general community were invited through newsletters (e.g. Seniors Cards’ newsletter), or social media (e.g. Facebook). Individuals who expressed interest in participating in the study were contacted by the research team and screened for eligibility, according to the following eligibility criteria: i) aged 18 years or older; ii) reported chronic LBP persisting for over 12 weeks; iii) discharged from physiotherapy but still symptomatic (score at least 3 on a 0–10 Numerical Pain Scale); iv) regular (weekly) users of a computer or internet-connected mobile/tablet device; and v) fluent in English (verbal and written). Exclusion criteria included: i) pregnancy; ii) diagnosis of serious spinal pathology (e.g. metastatic, inflammatory, or infectious diseases of the spine); iii) a history of spinal surgery in the past 12 months; iv) fibromyalgia, or systemic/inflammatory disorder; v) comorbid health conditions that would prevent active participation in increasing physical activity levels: cardio-respiratory illnesses; or vi) LBP caused by involvement in a road traffic accident in the last 12 months or ongoing litigation. Patients who met the inclusion criteria at the hospital were given a pamphlet about the study. Potential participants interested in participating in the study were referred to the research team. Patients could either contact the research team directly through the phone number provided in the pamphlet or be contacted by the research team via their contact details provided by the hospital staff. Patients who agreed to participate arranged a date and time to see a study investigator at the physiotherapy department soon after discharge. On the assigned date and time, a signed consent form was recorded, and baseline data were collected. People from the general community went through a slightly different process, if they were interested in the trial they could contact the research team via e-mail or via phone. Screening of potential participants from the general community was accomplished by e-mail or over the phone by a study investigator. If they met the inclusion criteria and had been recently discharged from treatment for their back pain (e.g. exercise therapy, spinal manipulative therapy), they were invited to see a study investigator at the University of Sydney where the research team was based. The weekly follow-up surveys were sent to participants via an electronic link embedded in a mobile text message or e-mail. No reminders were sent after the weekly survey; however, if the participant did not respond to the survey for four consecutive weeks, the study administrator received a reminder to contact the participant. One week before the end of the 6-month intervention, a study investigator contacted the participant to arrange a time to conduct the 6-month follow-up assessment, which was also completed online on the investigator’s iPad. If the participant was not able to meet to study investigator, the questionnaire was sent via e-mail, and the Actigraph was sent to the participant’s address via post. Randomisation was performed in a 1:1 ratio to the active intervention or standard care group. To ensure allocation concealment, randomisation to groups was undertaken by a blinded remote investigator (MS) not involved in recruitment using a computer-generated random number schedule of 10 permuted blocks of 6 and the final block of 8. Study investigators conducting data collection were blinded to group allocation. The intervention group received a physical activity and sedentary behaviour information booklet developed by the Australian Government Department of Health called ‘Make your move – Sit less, be active for life’  and advice to stay active delivered by the study investigator right after baseline completion and before randomisation. In addition, after randomisation, participants developed an individually tailored physical activity plan with guidance from a health coach, who was trained through the Wellness Coaching Australia course. Each participant received an initial home-based face-to-face coaching session that lasted between 1 and 2 h, that included motivational interviewing and solution-focused goal setting. The focus of the patient-centred physical activity plan was to motivate and support participants to gradually increase their leisure-time and incidental physical activity. Participants were encouraged to devise fortnightly goals to suit and advance their physical activity levels. After the first face-to-face coaching session, the health coach contacted participants fortnightly (12 phone calls per participant over 6 months) to assess progress, update short-term goals, and assist in overcoming barriers. This intervention was also supported by an activity tracker (Fitbit), and a specifically designed mobile web application (IMPACT app) (Fig. 1). Participants were able to access the IMPACT app at any time to monitor their goals and physical activities and report on physical activity-related goals. The health coach used the participant reports to guide the telephone coaching sessions, discuss participants’ goals, and progress. Personalised messages, referred to as “healthy tips”, were sent on a weekly basis to encourage participants to achieve their goals. The intervention details are included in Table 1. Low back pain is a significant public health problem and engagement in moderate levels of physical activity is associated with positive outcomes. Conservative active care, such as exercise, is effective in reducing pain and disability associated with chronic low back pain. However, a rapid decline in clinical outcomes is commonly seen after discharge from treatment. These problems need to be urgently addressed as the burden of low back pain continues to rise. • A specifically designed mobile web application (IMPACT app) to monitor participants’ goals and physical activities. • A pedometer enhanced with a web-interface (“fitbit”, www.fitbit.com/au) to give feedback on the amount of daily physical activity achieved. 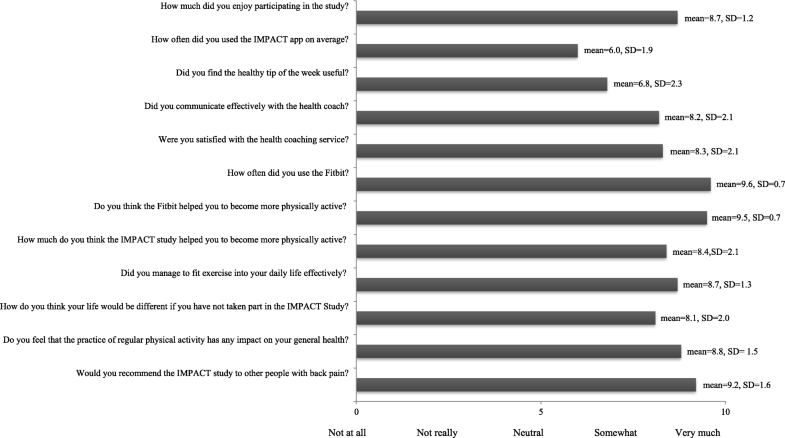 Telephone or email-based health coaching was used to identify barriers and facilitators to physical activity participation, and to provide education and support to assist participants to achieve their physical activity goals. Three health coaches with professional backgrounds in physiotherapy and exercise physiology delivered the intervention. The health coaching was delivered during one face to face session plus 12 fortnight telephone-based sessions. The intervention was delivered to people with chronic low back pain after discharge from treatment from hospitals and general community in Sydney and surrounds, Australia. The face to face assessment and interview occurred at the beginning of the intervention period and lasted for approximately 2 h. The telephone-based health coaching occurred after the face to face assessment and interview, once every 2 weeks for approximately 20 min for a total duration of 6 months. The physical activity plan was tailored to participant goals, current physical ability and preferences. The control group received the ‘Make your move – Sit less, be active for life!’  booklet and brief advice to stay active which was delivered right after baseline completion and before randomisation by a study investigator. After randomisation, participants received an advice to work independently towards increasing their physical activity levels and achieving their two long-term goals as defined at baseline, which was delivered once, over the phone, by a study investigator. Records were kept of the number of individuals screened for eligibility, the number eligible and invited to participate and the number that consented to participate per recruitment site. When available, the reasons for not entering the study were also recorded. Our recruitment metric was calculated based on the number of participants consenting to participate in the study as a proportion of participants invited. The number of participants who responded and provided valid data for each weekly follow-up of primary outcomes (completeness of data) was recorded. This is a crucial aspect of data quality and an important measure as we collected data electronically on a weekly basis. We assessed completeness of data collected for each of the outcome measures, with > 80% valid data used as criteria to consider the study feasible. We also recorded who complied with the accelerometer (Actigraph) protocol (compliance). Compliance with the accelerometer protocol was considered valid if the participant wore the device for at least 10 h a day for at least four days. A previously established algorithm (Choi 2011) was used to determine ‘non-wear’ time. Participant’s compliance with the intervention was also measured by the number of health coaching sessions completed. A semi-structured interview with intervention participants who completed the study was conducted to gather data on their experience, and the barriers and facilitators to participation. Participants also rated their experiences regarding the health coaching, use of the Fitbit, and the IMPACT web app, using open-ended questions as well as Likert-based scales. In this study, only quantitative data from the interviews are presented. Qualitative data will be presented in a future publication. Primary clinical outcomes were care-seeking, pain levels and activity limitation, collected weekly during the 6 months of the intervention through a study-specific electronic survey that included questions about LBP (Additional file 1). An episode of care-seeking was defined as a consultation or a series of consultations for LBP based on the definition that has been suggested by de Vet et al. Consultations for LBP included visiting a GP, a physiotherapist, a chiropractor, emergency department or surgical procedure. Self-management (e.g. medication, heat pack) was also considered as care-seeking. Pain levels were assessed with an 11-point scale ranging from 0 to 10, where 0 defines the absence of pain and 10 describes unbearable pain, the numerical rating scale (NRS). Although in the protocol of this study, we refer to one of the primary outcomes as disability, we have renamed this outcome to activity limitation which is more suitable to our research question. This was a protocol deviation. Activity limitation was based on the question: “Was the low back pain bad enough to limit your usual activities in the last 7 days?”, and it was assessed weekly over 6 months. Disability was also assessed using the Roland–Morris Disability Questionnaire (RMDQ; range 0–24)  but only at baseline and 6-month follow-up and is presented as a separate outcome. Secondary outcomes were assessed at baseline and 6-month follow-up. Self-reported physical activity was assessed using the International Physical Activity Questionnaire (IPAQ; minutes of engagement in physical activity per week). Physical activity was assessed objectively over a 7-day period using the accelerometer (Actigraph GT3X+). To be considered a valid day, wear time was defined as 10 h or more on four or more days, and non-wear time was defined as 90 min of consecutive zero counts. This was a deviation of the protocol determined to improve the quality of the Actigraph data as recently published studies [55–57] have shown that a 90-min non-wear time window is more sensitive and specific when compared to a 60-min non-wear time window when analysing 24 h-accelerometry. Actigraphs were initialised to collect triaxial acceleration data using a frequency of 30 Hz, and data were aggregated to 60-s epochs using Actilife software 6.13.3. Physical activity data were summarised to produce measures of overall light physical activity, moderate-to-vigorous physical activity (MVPA) and average step count per week. This was a deviation from the protocol in order to aid interpretation based on the World Health Organization (WHO) physical activity guideline recommendation of 150 min of MVPA per week. Goal attainment was assessed using the Goal Attainment Scale (GAS; range − 2 to 2). Participants were requested, at baseline, to set two goals (related to physical activity) to be achieved within 6 months and the degree of goal attainment was assessed at 6 months. Other variables, such as fear avoidance beliefs, emotional states of depression, anxiety and stress, and sleep quality have been collected and is reported at baseline only. Fear avoidance was assessed using the Fear-Avoidance Beliefs Questionnaire (FABQ; range 0–96). There are two subscales within the FABQ; the work subscale (FABQw) with 7 questions (range 0–42) and the physical activity subscale (FABQpa) with 4 questions (range 0–24). Emotional states of depression, anxiety and stress was assessed using the Depression Anxiety Stress Scale (DASS; range 0–21 each domain). Sleep quality was evaluated using item 6 from the Pittsburgh Sleep Quality Index (PSQI)  which evaluates sleep quality based in four categories (very bad, fairly bad, fairly good, very good). Descriptive statistics were used to describe the baseline characteristics of included participants. We used multilevel mixed-effects models to calculate between-group incidence rate ratios (IRR) for the number of episodes of care-seeking, and activity limitation per person throughout the follow-up period (6 months) using Poisson regression. We estimated the group effect over time by fitting an interaction term between group and time. We also used the multilevel mixed-effects model, taking into account individual follow-up time, the frequency of events, non-normal distribution of data over time, and non-independence of repeated measures. Pain intensity was analysed as a continuous repeated variable using a multilevel mixed linear regression model with random intercepts. The effect of group allocation at single time points (baseline and 6-month follow-up) on continuous outcomes (e.g. disability and physical activity) was assessed using linear regression models. We analysed between-group differences in mobility-related goal attainment at 6 months. To aid interpretation of the GAS, the scores were dichotomised (goal met versus goal not met), and odds ratios calculated. For the analysis, we have chosen the highest GAS score. For instance, if the goal one was scored as “0” and the goal two as “-1”, we have used “0” for the analysis. This was a protocol deviation. All analyses were performed by intention to treat. Stata IC 12.0 (StataCorp Texas, USA) was used for analyses. The flow of participants through the study is shown in Fig. 2. In total, 152 potential participants were screened for eligibility, from those 90 met the inclusion criteria (59%) and were invited to participate, with 68 agreeing to participate (75%). Of these, 33 participants were recruited over 12 months following discharge from physiotherapy treatment in outpatient departments of four public hospitals; and 35 participants were recruited over three months from the general community (51%). Thirty-four participants were randomised to one of the two groups. Most people from the hospital sites that did not meet the inclusion criteria were excluded because they did not speak English, as opposed to people from the general community that were excluded because they had not previously had physiotherapy treatment for their chronic LBP. Follow-up data were collected from 31 intervention group participants (3 dropouts), and from 24 control group participants (10 dropouts), with a total of 19% of loss to follow-up. Participant characteristics are described in Table 2. The two groups did not differ significantly on demographic factors, (mean age was 58.4 SD ± 13.4, and 50% were female), however, there was a 12% difference in gender between the groups, with the intervention group containing fewer females than the control group. Most participants were non-smokers (58%) and were considered overweight [Body Mass Index (BMI) mean 28.0 SD ± 5.5]. Participants assigned to the intervention and control groups were similar regarding pain levels and disability. Participants in the intervention group reported slightly higher baseline self-reported MVPA (minutes per week) when compared to the control group (mean = 199.1, SD ± 672.2; mean = 129.8, SD ± 392.2, respectively). However, objective measures of physical activity revealed similar results between groups (e.g. average time spent in MVPA was 197.5, SD ± 141.1; and 209.0, SD ± 170.5, for the intervention and control groups respectively). Nevertheless, the total minutes of physical activity per week measured with the Actigraph was higher in the intervention group when compared with the control group (mean = 2241, SD = 886; mean = 2099, SD = 842, respectively). Unfortunately, there were some technical issues with the web-based application used to collect outcomes which influenced the number of weekly surveys sent to the participants. For this reason, not every participant received the same number of surveys, however, on average, participants received 19 weekly surveys in total over the 6 months. From the surveys sent, on average 16 were completed. Overall, 903 weekly questionnaires were answered by participants from a total of 1107 sent (89%), which was above the cut-off point established to test the feasibility of the study (80%). From those, 469 (52%) weekly surveys were completed by participants in the intervention group (mean = 15 weekly surveys completed per participant, IQR = 15), and 434 (48%) were completed by participants in the control group (mean = 16, IQR = 22). Overall, there were 20% of missing data at the 6-month questionnaire follow-up and 16% of missing data across the 6-month weekly surveys. Actigraph data were collected for 48 of the 68 participants (71%). From those, 28 (58%) participants were from the intervention group, and 20 (42%) participants were from the control group. The remaining participants failed to wear the Actigraph for at least four days as required and the data collected were insufficient for analysis. We aimed to interview a minimum of 20 participants. Of the 31 participants from the intervention group who completed the 6-month follow-up, 24 were interviewed about their experiences with the intervention. The other seven participants completed the follow-up before ethics was granted for the interviews and therefore were not invited to participate. Overall, participants were satisfied with the intervention (mean = 8.7 on the 0 to 10 satisfaction scale, where higher scores indicate higher satisfaction) (Fig. 3). Participants were presented with the main features of the study (e.g. the Fitbit, the health coaching, the IMPACT app or receiving the weekly surveys) and were asked to rank the level of preference. The aspect of the intervention that participants enjoyed most was using the Fitbit (53%), followed by the health coaching (29%). The aspect they least enjoyed was receiving the weekly surveys (6%). Most intervention group participants (n = 23, 96%) reported wearing the Fitbit every day or most days during the intervention and felt that it was useful to motivate them to be more active, with most participants (71%) engaging in physical activity for four or more times per week. Furthermore, most participants (88%) believed the amount of contact with the health coach (mean = 11 sessions, SD ± 2) was appropriate and reported that coaching sessions were helpful for encouraging them to be physically active. No adverse events were reported. Data on the primary outcomes are presented in Table 3. Primary outcomes were collected weekly for 6 months in total. Overall, the average number of care-seeking episodes/person per group was higher in the control group when compared to the intervention group (mean = 6.3, SD ± 7.8, mean = 3.1, SD ± 4.6, respectively). However, this difference between groups did not reach statistical significance. The Poisson regression analysis showed that participants in the intervention group, on average, and across the follow-up period, had a 38% non-significant reduced rate of care-seeking (IRR: 0.62, 95% CI: 0.32 to 1.18, p = 0.14) compared to control group. Regarding the group effect over time, there was a weekly reduction rate of care-seeking of 3% in the intervention group (IRR: 0.97, 95% CI: 0.93 to 1.01, p = 0.14) (Fig. 4). There were no between groups differences for activity limitation during the follow-up period. Regarding the group effect over time, there was a non-significant weekly reduction of 1% in the rate of activity limitation in the intervention group (IRR: 0.99, 95% CI: 0.96 to 1.02, p = 0.66). For pain levels there were no between groups differences across the follow-up period and we did not find any group effect over time. Table 4 shows the group data at baseline and 6 months for the secondary outcomes. Participants in the intervention group self-reported more walking at follow-up (assessed with the IPAQ) compared with the control group (183.1 min per week; 95% CI: 48.5 to 317.7, p = 0.009) and a higher proportion of the intervention group attained their physical activity goals at 6 months compared to the control group (OR: 6.5; 95% CI: 1.9 to 22.5, p = 0.003). There were no between-group differences for self-reported MVPA, or objectively assessed physical activity assessed. 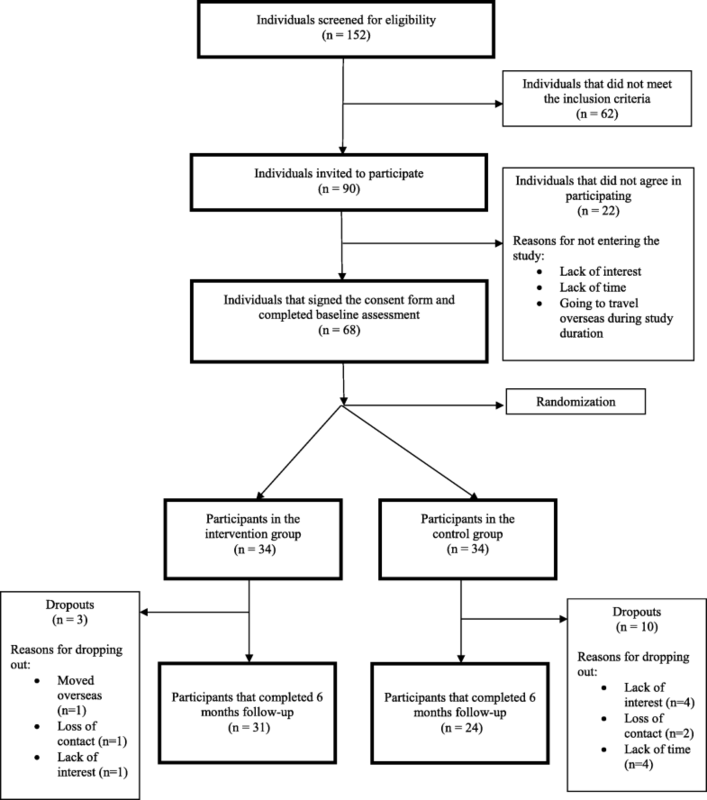 Results from this study indicate that a physical activity intervention for people with chronic LBP that involves health coaching, activity trackers, and m-Health over 6 months is feasible and acceptable by the target population. Our results also indicate some impact of the intervention on the primary outcome of care-seeking and the secondary outcomes of self-reported walking and physical activity goal attainment. Ease of participant recruitment differed in the hospital setting compared with the general community, with more participants recruited from the general community in a shorter period compared with the public hospitals over a longer period. This discrepancy is likely due to the culturally diverse background of patients screened at the hospitals when compared to the general community, with sufficient English language skills being required for study enrolment. Australia is known to have a large culturally diverse migrant population, and this can present challenges for clinical trial recruitment and intervention delivery. To overcome this limitation, translation services could be utilised to facilitate recruitment and study implementation in culturally diverse hospital sites. Further potential challenges identified in this study should be considered for the implementation of a full-scale trial. One aspect that deserves attention is the high number of drop-outs in the control group, which at 19% was lower than the anticipated 35% previously reported in the trial protocol. A lower drop-out rate in the control group may be achieved with the inclusion of a sham advice group, with the same amount of therapist interaction (phone calls) as the intervention group. Also, the weekly data collection resulted in a large amount of missing data, which could have underpowered our study to detect intervention effects on care-seeking and pain intensity. To reduce the amount of missing data, primary outcomes could be collected less frequently (for example on a fortnightly basis) to minimise study burden on participants. Further, this study was associated with a 42% rate of loss to follow-up in the physical activity outcome, which in part reflects the requirement to wear the accelerometer for seven days. To increase compliance with the Actigraph protocol, participants could be contacted during the 7-day period of data collection and be reminded to use the Actigraph for at least 10 h a day during that week. Lastly, in order to more accurately measure the impact of the intervention on physical activity levels, in a future full-scale trial the inclusion criteria should take into consideration participants’ level of physical activity at baseline. As the intervention targeted increasing participants’ physical activity levels, people that are already exceeding physical activity guidelines at baseline should be excluded and recruitment should focus in targeting those recognised as inactive. Although this pilot clinical trial was not powered to detect a difference in healthcare utilisation, the direction and magnitude of findings suggest a possible beneficial effect of the intervention to reduce care-seeking over time. Also, we observed a significant increase in the amount of self-reported walking in the intervention group compared to the control group, but not in MVPA assessed either by self-report or objective methods. Furthermore, a higher number of participants in the intervention group (65%) achieved their physical activity goals as compared to the control group (22%), indicating a beneficial impact on behaviour. To the best of our knowledge, this is the first study that has investigated the effect of a health coaching physical activity intervention not only in decreasing pain and activity limitation but also in decreasing care-seeking in people with chronic LBP after discharge from physiotherapy treatment. To date, there is insufficient evidence of the effect of health coaching-based interventions for decreasing pain and activity limitations in people with LBP. [66, 67] Most published trials have not clearly defined the principles on which the health coaching is based (e.g. behaviour change theory, motivational interviewing), or the methods by which coaches are trained (e.g. certified courses, amount of training) to ensure the treatment is delivered as intended. This variability in study settings challenges the comparison of our findings with previous studies. Our study clearly defined the intervention, which involved health coaching, based on goal setting, motivational interviewing and behaviour change theory, which has been identified by a recent systematic review  to be the most effective approach to improve health outcomes. Recent research has suggested that chronic LBP interventions should prioritise self-management to reduce healthcare utilisation rather than pain intensity, given that pain levels are not significantly sensitive to change over time. However, the main challenge to effective self-management of LBP is limited adherence to physical activity and lifestyles that are most likely to reduce the physical and emotional “triggers” that aggravate symptoms of LBP. Although we did not observe between-group differences in pain or activity limitation in our study, we detected a trend of reduction in care-seeking and a significant increase in walking and physical activity goal attainment in favour of the intervention group, which are clinically valuable. To detect a clinically meaningful between-group difference, a full-scale randomised controlled trial could estimate the sample size based on care-seeking rates observed in this trial. With regard to physical activity, there was a significant increase in walking time in the intervention group compared to the control group. Most recent guidelines support walking as an essential component of management for chronic LBP. In our study, intervention participants were encouraged to use the Fitbit, which has been found to be effective in increasing walking in people with LBP. The Fitbit was used as a feedback tool and participants were encouraged to walk and set goals related to step count in addition to the other preferred activities. Additionally, we found a significant between-group difference in goal attainment at 6 months in favour of the intervention group. This may be explained by the fact that many participants set goals related to walking, which increased significantly in the intervention group. Moreover, many participants set goals associated with specific structured activities, such as yoga, Pilates or swimming, which are activities that are less sensitive to be registered with the Actigraph. [44, 73] Consequently, it is likely that this device was not sufficiently sensitive to detect increases in participation for these types of activities. A potential limitation is that our intervention included several pragmatically delivered components, such as health coaching, which included a range of techniques (i.e. goal setting, motivational interviewing), activity trackers, and mobile technology (IMPACT App). As yet, it is unclear which techniques or components of the intervention are effective or not. However, this is a pilot trial, and therefore the main aim was to evaluate the feasibility and preliminary efficacy of outcomes and its impact on healthcare utilisation. Moreover, we did not evaluate frequently reported cognitive and emotional factors such as fear of movement, catastrophising, and anxiety, which impact on pain and activity limitation. A closer exploration of these cognitive behavioural factors and their impact on pain and disability is needed. Another potential limitation is that there was no follow-up contact with the control group, apart from the weekly survey sent via mobile text message or e-mail. It can be argued that since the intervention group received greater contact from the research team, this contextual factor could have influenced the results. We aim to include a sham advice group in a future full-scale trial to minimise this issue. This pilot trial provides proof of concept, preliminary evidence of the success of the intervention, and evidence that this patient-centred physical activity intervention (supported by health coaching and m-Health technology) is feasible in a population with LBP. The intervention was associated with increased mobility goal attainment and walking volume at 6 months and may reduce rates of additional care-seeking after treatment discharge. This result, however, should be interpreted cautiously due to underpowered analysis. If these effects are evident in a full-scale trial, this novel model of care may be an effective management strategy for patients with chronic LBP after treatment discharge, and the public health implications would be substantial. ABA is supported by Coordenação de Aperfeiçoamento de Pessoal de Nível Superior (CAPES), Brazil. PHF is funded by an NHMRC Research Fellowship and University of Sydney SOAR Fellowship. MLF holds an MRFF/NHMRC Career Development Fellowship and is a Sydney Medical Foundation Fellow. AT holds an NHMRC Career Development Fellowship. This study was funded by a competitive grant awarded by the Medibank Health Research Fund. The funding body had no involvement in study design, data collection, analysis, interpretation of data, or writing the manuscript. AA: conducted, designed, and supervised the study; analysed the data; drafted, reviewed, and edited the manuscript; and contributed to the discussion; EP, MS, ML, MJ, AT: designed the study; reviewed and edited the manuscript; and contributed to the discussion; APC: collected data; reviewed and edited the manuscript; EC: assisted with data analysis, reviewed and edited the manuscript; AK: assisted with data analysis; reviewed and edited the manuscript; and contributed to the discussion; PF: conducted, designed, and supervised the study; reviewed the manuscript; and all authors: read and approved the final manuscript. The Human Research Ethics Committee from the South Western Sydney Local Health District approved this study (project number: 15/015). Participants gave written informed consent before data collection began.